Objectives To describe the epidemiology of infant pertussis in King County, Washington, and to better understand the implications for tetanus toxoid, reduced diphtheria toxoid, and acellular pertussis (Tdap) vaccination among older children, adolescents, and adults. Design Retrospective analysis of reported pertussis cases among infants younger than 1 year, January 1, 2002, through December 31, 2007. Participants Reported pertussis cases among infants younger than 1 year between 2002 and 2007. Main Outcome Measures Bordetella pertussis from a household member or close contact was the primary exposure. The main outcome measures were age and vaccination status, incidence by race/ethnicity, suspected exposure, and Tdap eligibility of household members and close contacts. Results Among 176 confirmed cases of infants with pertussis, the median age was 3 months (age range, 0-11 months); 80.1% were younger than 6 months. Seventy-seven percent were age-appropriately vaccinated. Between 2002 and 2007, the overall mean annual incidence was 136 cases per 100 000 infant population. Compared with a mean annual incidence of 73 cases per 100 000 infant population among whites, the incidence was 246 cases per 100 000 infant population among blacks (rate ratio [RR], 3.37; 95% confidence interval [CI], 2.59-4.44) and 194 cases per 100 000 infant population among Hispanics (RR, 2.66; 95% CI, 2.02-3.53). Households were the suspected exposure location for 70.0% of cases. Case households had a median of 3 (range, 1-15) Tdap-eligible persons. Conclusions The burden of infant pertussis in King County, Washington, was high between 2002 and 2007, especially among racial/ethnic minorities. Tdap vaccination of eligible household members and close contacts should be promoted as an additional means of protecting infants from pertussis. The Advisory Committee on Immunization Practices recommends that infants should receive the first 3 diphtheria and tetanus toxoids and acellular pertussis (DTaP) vaccinations at ages 2, 4, and 6 months.9,10 Additional doses are recommended at ages 15 to 18 months and 4 to 6 years. The efficacy of 3 doses of DTaP is 80% to 85% against confirmed cases of pertussis as defined by the World Health Organization (paroxysmal cough for ≥21 days and confirmed by culture, serology, or an epidemiologic link to a confirmed case).11-13 Vaccine efficacy after 1 or 2 doses of DTaP is not clearly defined but seems to increase with each successive dose. Therefore, infants younger than 6 months are particularly vulnerable to pertussis: they are the age group among whom pertussis disease is most severe, and they are not well protected even if they are age-appropriately vaccinated because they have not yet received 3 DTaP doses. We reviewed reported cases of infant pertussis in King County, Washington, between 2002 and 2007. Objectives of the study were to describe the epidemiology of this disease, to assess the burden of presumed household transmission, and to evaluate the eligibility for Tdap vaccination of household members and close contacts of infants with confirmed pertussis. Notifiable disease surveillance data from Public Health–Seattle & King County served as the primary data source for this study. Cases were reported from multiple sources, including laboratories, health care providers (ie, physicians, nurse practitioners, and nurses), hospitals, and clinics. After a pertussis case is reported to Public Health–Seattle & King County, public health personnel investigate to gather information on demographics, vaccination status, clinical course, contacts, and the need for public health intervention. Records of pertussis case investigations among infants younger than 1 year reported from January 1, 2002, through December 31, 2007, were reviewed for this study. We used the 1997 Centers for Disease Control and Prevention–Council of State and Territorial Epidemiologists case definition and classification criteria to define confirmed and probable cases of pertussis.18 To meet clinical case definition, the person must have a cough that lasts 2 weeks or longer with at least 1 of the following: paroxysmal coughing, posttussive vomiting, or an inspiratory whoop. Laboratory confirmation, using specimens obtained from a nasopharyngeal swab or aspirate, requires isolation of B pertussis from culture or a positive result for B pertussis DNA by polymerase chain reaction (PCR). A confirmed pertussis case must meet 1 of the following 3 scenarios: (1) a cough of any duration with isolation of B pertussis by culture, (2) a cough that meets the clinical case definition and is confirmed by a positive result for B pertussis DNA by PCR, or (3) a cough that meets the clinical case definition and is epidemiologically linked to a case confirmed by culture or PCR. A probable pertussis case meets the clinical case definition but is not laboratory confirmed or epidemiologically linked to a case confirmed by culture or PCR. We also used a locally defined classification, a possible pertussis case, for persons with a compatible clinical illness and in whom the health care provider was suspecting pertussis but who did not qualify to be classified as a confirmed or probable case. All cases of pertussis were followed up by public health personnel until criteria for the case definition were met and not necessarily for the full duration of cough. For this study, infants were considered age-appropriately vaccinated if they received dose 1 of DTaP before age 3 months, dose 2 before age 5 months, and dose 3 before age 7 months. Household members and close contacts were considered Tdap eligible if they were aged 11 to 64 years; data were unavailable on the number of Tdap-eligible household members and close contacts who actually had received Tdap before the infant's onset of illness. Household members were defined as living in the same housing unit as the pertussis case infant. The definition of close contacts was determined on a case-by-case basis. An example of a close contact would be direct face-to-face contact or close proximity for a prolonged period to a patient with pertussis during his or her contagious period. The suspected source of pertussis transmission was determined during case investigations by local public health personnel on the basis of the presence of symptoms compatible with pertussis in a household member or other close contact of a case infant before onset of symptoms in the patient. County census data between 2002 and 2007 were the source for King County infant population size. Analysis was performed using commercially available statistical software (SPSS 14.0; SPSS Inc, Chicago, Illinois; and STATA 10.0; StataCorp LP, College Station, Texas). Two hundred fifty-eight pertussis cases among infants younger than 1 year were reported to Public Health–Seattle & King County between 2002 and 2007. Of these cases, 176 were classified as confirmed, 19 as probable, and 63 as possible cases. Among confirmed cases, 83 (47.2%) were confirmed by culture, and 88 (50.0%) were confirmed by PCR. Among 176 confirmed cases of infants younger than 1 year with pertussis, the median age was 3 months (age range, 0-11 months); 141 patients (80.1%) were younger than 6 months, and 95 patients (54.0%) were male. The primary language spoken by the parents of infants with pertussis was English for 151 cases (86.0%) and Spanish for 21 cases (11.9%). Of 176 confirmed patients, 71 (40.3%) were white, 30 (17.0%) were black, 30 (17.0%) were Hispanic, 20 (11.4%) were Asian or Pacific Islander, and 25 (14.2%) were of unknown or other race/ethnicity. The overall mean annual incidence for confirmed cases between 2002 and 2007 was 136 cases per 100 000 infant population (range by year, 56-238 cases per 100 000 infant population). Black infants had the highest incidence among all racial/ethnic groups, with 246 cases per 100 000 infant population (range by year, 149-388 cases per 100 000 infant population) and a rate ratio (RR) of 3.37 (95% confidence interval [CI], 2.59-4.44), compared with whites. At the other end of the spectrum, whites had 73 cases per 100 000 infant population (range by year, 37-160 cases per 100 000 infant population). Among Hispanics, the annual incidence was 194 cases per 100 000 infant population (range by year, 76-309 cases per 100 000 infant population), with an RR of 2.66 (95% CI, 2.02-3.53) compared with whites. For Asian or Pacific Islanders, the annual incidence was 112 cases per 100 000 infant population (range by year, 0-275 cases per 100 000 infant population), with an RR of 1.53 (95% CI, 1.13-2.09) compared with whites (Table 1). No clear trends were identified over time, overall or in any racial/ethnic group. Year-to-year variations are given in Table 1, with a peak in confirmed cases seen in 2005. Vaccination status was known in 175 of 176 case infants (99.4%). Among these confirmed patients, 135 (77.1%) had been appropriately vaccinated with DTaP. Given that the median age of patients was 3 months, the median number of DTaP doses received before onset of illness was 1 (range, 0-4) (Table 2). For 41 infants who were not age- appropriately vaccinated, philosophical exemption was provided as a reason in 8 cases (19.5%), and the reason was unknown in 27 cases (65.9%). Numbers of DTaP doses received before onset of illness among the age groups (0-1, 2-3, 4-5, and 6-11 months) are given in Table 3. By definition, all 176 confirmed cases included a cough, and 170 patients (97.0%) had a paroxysmal cough (Table 4). Other signs and symptoms included posttussive vomiting in 144 infants (81.8%), apnea in 139 (79.0%), cyanosis in 74 (42.0%), and inspiratory whoop in 46 (26.1%). A median of 2 (range, 1-7) medical visits and a median of 11.5 days (range, 1-57 days) from the onset of symptoms elapsed before the diagnosis of pertussis was made. Among 176 confirmed cases, 80 patients (45.5%) were hospitalized, and the median length of stay among these was 4.5 days (range, 1-36 days). The median age of 80 hospitalized infants was 2 months (age range, 0-11 months) compared with a median age of 4 months (age range, 1-11 months) for 96 nonhospitalized infants. Sixteen of 80 hospitalized infants (20.0%) required intensive care. The most common complication was pneumonia, reported in 14 of 176 infants (8.0%). No deaths were reported. Households were the suspected exposure location for 123 infants (70.0%); 43 infants (24.4%) had an unknown exposure. Among 176 confirmed cases, 991 household members and close contacts were reported to have had contact with the infant before onset of illness. A median of 5 (range, 2-29) household members and close contacts was reported per infant. Among household members and close contacts, 376 persons reportedly had respiratory tract symptoms (ie, a prolonged cough) before onset of illness in the infant, with a median of 2 persons (range, 0-12) per case. A median of 3 (range, 1-15) household members and close contacts per case (a total of 472 throughout the study period) were aged 11 to 64 years and Tdap eligible. Hispanics had the most Tdap-eligible household members and close contacts (n = 157), with a median of 4 (range, 3-16) household members and close contacts per case. Between 2002 and 2007, the incidence of infant pertussis in King County, Washington, was higher than the national mean; for example, in 2005, the King County incidence was more than twice that of the incidence in the United States.7 This high rate of infant pertussis occurred despite immunization coverage rates in King County that have been comparable to or higher than the national mean for pertussis-containing vaccine during the study period.19 Whether this higher incidence of reported infant pertussis in King County is attributable to superior pertussis diagnosis, better notifiable disease reporting, or regional differences in endemic rates of pertussis is unknown. Regardless of the cause, the higher incidence requires additional tools and strategies to address this issue. Vaccine efficacy after the third dose of DTaP, administered at 6 months, is 80% to 85%.11-13 In our study, 80.1% of confirmed cases of infant pertussis occurred among infants younger than 6 months and too young to have received the first 3 DTaP doses. This observation reinforces the need to use strategies in addition to the 3 routine DTaP doses during infancy to decrease the risk for pertussis transmission to infants. We determined that the household was the suspected source of pertussis transmission to infants in 70.0% of confirmed cases. This is consistent with previous studies20,21 in which family members were the source of pertussis transmission to infants in at least 75% of cases in where a source could be identified. Notably, we determined that approximately 50% of household members and close contacts of infants with pertussis were Tdap eligible (ie, they were aged 11-64 years), presenting a critical opportunity to decrease transmission through vaccination with Tdap. Because we had no vaccination histories for household members and close contacts, we could not subtract from this estimate those household members and close contacts who had been vaccinated with Td in the previous 10 years. 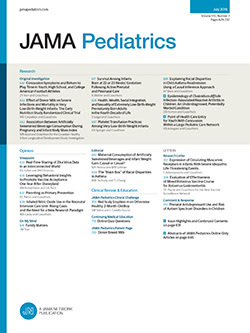 Given that the parents of infants with pertussis often have been identified as the source of infection, the Advisory Committee on Immunization Practice and the American College of Obstetricians and Gynecologists have recommended Tdap vaccination of previously unvaccinated women during the immediate postpartum period.17,22 In addition to postpartum women, all older children, adolescents, and adults who are close contacts of or are in the same households as infants should be targeted for Tdap vaccination. During our study, we also observed increased pertussis incidence among racial/ethnic minorities, especially black and Hispanic infants compared with white infants, highlighting the need for Tdap vaccination efforts to decrease the burden of disease among these populations. This increased incidence among racial/ethnic minorities also underscores the need for additional analysis to evaluate characteristics that differ among these groups. Areas for further study could include an evaluation of differences among racial/ethnic minorities with regard to vaccination status, suspected exposure, time from onset of illness to diagnosis, number of visits to a health care provider until diagnosis, and hospitalization. A notable finding was the high rate of philosophical exemptions among infants who were not age-appropriately vaccinated. Increased incidence of pertussis has been reported among communities with high rates of philosophical exemptions.23-26 These exemptions are legal in many states, including Washington, where philosophical exemptions have been increasing in recent years. Some parents who have refused vaccination for their children on philosophical grounds might also be resistant to Tdap vaccination for themselves. Therefore, the potential effect of philosophical exemptions on Tdap vaccination efforts among household members and close contacts of infants should be monitored. A limitation of this study is that we had no data on Tdap vaccination status of household members and close contacts (such information is now collected, beginning January 1, 2009). However, because most of the study period predated the recommendation for Tdap vaccination of older children, adolescents, and adults and because of the typically slow uptake of new vaccine recommendations among these age groups, we believe that most older children, adolescent, and adult contacts of our patients had not received the Tdap vaccine. In support of this assertion are results from the 2006 and 2007 National Immunization Survey, in which Tdap vaccination coverage among adolescents aged 13 to 17 years was 10.8% (range, 9.4%-12.3%) in 2006 and 30.4% (range, 28.2%-32.7%) in 2007.27,28 Other study limitations are related to the manner in which case investigations are conducted by public health personnel. Assessment of a suspected source of pertussis transmission on the basis of symptoms compatible with pertussis is subjective. Because follow-up occurred only until the case definition was satisfied, we might have underestimated the duration of patient symptoms. In summary, in a community with high rates of infant pertussis, particularly among black and Hispanic infants, a substantial proportion of household and other close contacts of pertussis case infants is eligible for Tdap vaccination. Clinicians and public health professionals should promote Tdap vaccination of older children, adolescents, and adults who are close contacts of infants or are in the same households as infants and should consider targeted outreach to communities at increased risk. Correspondence: Matthew P. Hanson, MD, DTM&H, Global Health Program, Bill & Melinda Gates Foundation, 500 Fifth Ave N, Seattle, WA 98109. Accepted for Publication: January 12, 2011. Author Contributions:Study concept and design: Hanson and Duchin. Acquisition of data: Rietberg, Ohrt, and Duchin. Analysis and interpretation of data: Hanson, Kwan-Gett, Baer, and Duchin. Drafting of the manuscript: Hanson and Duchin. Critical revision of the manuscript for important intellectual content: Hanson, Kwan-Gett, Baer, Rietberg, Ohrt, and Duchin. Statistical analysis: Hanson and Baer. Obtained funding: Duchin. Administrative, technical, and material support: Duchin. Study supervision: Kwan-Gett and Duchin. Additional Contributions: Data collection and manuscript preparation were completed as part of normal job duties by Centers for Disease Control and Prevention and Public Health–Seattle & King County staff. We thank all of the public health personnel who assisted in conducting the thorough case investigations that made this retrospective analysis possible. In particular, we thank the late Linda L. Vrtis, RN, for her tireless dedication, attention to detail, and career spent improving the health of the public.